Do you ever do meatless Mondays? It’s actually a thing. And it’s pretty cool and hip and all that good stuff. I’m celebrating Meatless Monday with Gardein (garden + protein) today! And I never thought I’d get my husband on board, but he actually loves both meals I’m about to share with you. I work from home and sometimes I get so caught up in my work that I’m amazed when I look at the clock and it’s 1:00 PM and I’ve been working since 5:00 AM and all I’ve had is decaf coffee. Bad, bad girl! Where does the time go? And usually, I don’t really want to think about having to make something for lunch. Who has time for that? Ever since I found Gardein products in the freezer aisle of my favorite grocery store, my lunch choices have become easier. I don’t spend time wondering what in the world I’m going to eat and I don’t reach for that bag of chips calling my name from the pantry. 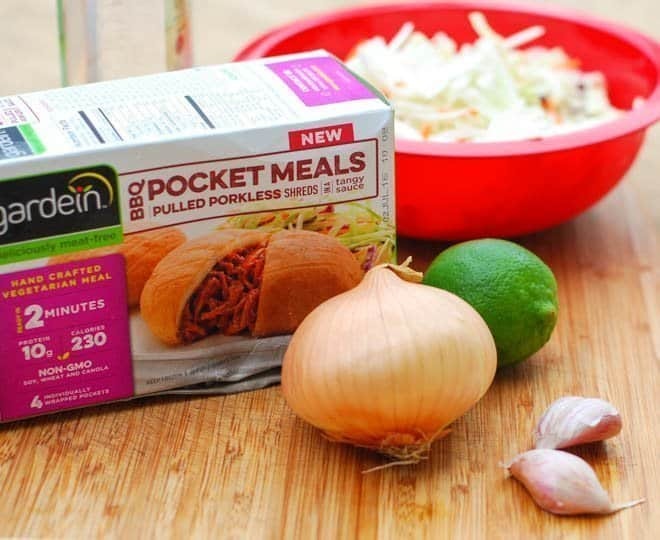 My new favorite lunch is Gardein BBQ Pulled Porkless Pocket Meals. It’s BBQ in a bun and obviously, there’s no pork. That’s a good thing since I don’t eat pork. I like that all of the Gardein products are made from non-GEO soy and wheat. They also have no cholesterol and are low in calories and fat. I add no-mayo coleslaw and my meatless lunch is complete (and delicious). 1 package tri-colored coleslaw mix, 16 oz. Whisk all ingredients (except for coleslaw mix ) in a small bowl. 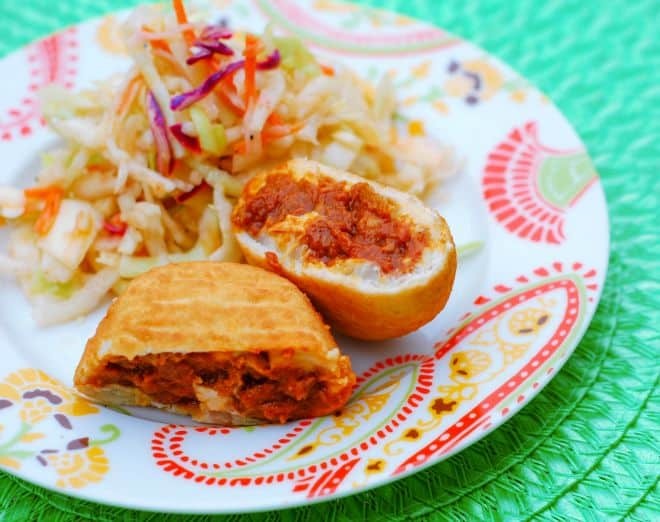 Toss with coleslaw mix and serve. Refrigerate leftovers. For Meatless Monday dinner, I serve a spring mix salad full of mushrooms, strawberries, and pine nuts. 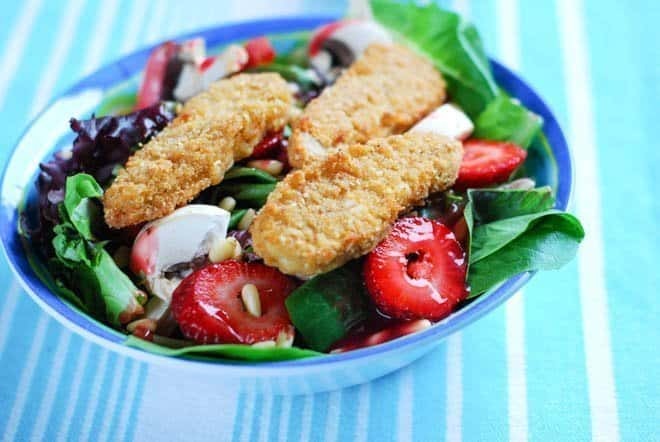 Then I top the salad with Gardein Seven Grain Crispy Tenders and drizzle with my mom’s homemade strawberry vinaigrette. Add some garlic bread (or not) and dinner is ready. The family really does like it and they don’t miss the meat at all. Mash the strawberries with a fork and whisk all the ingredients together. 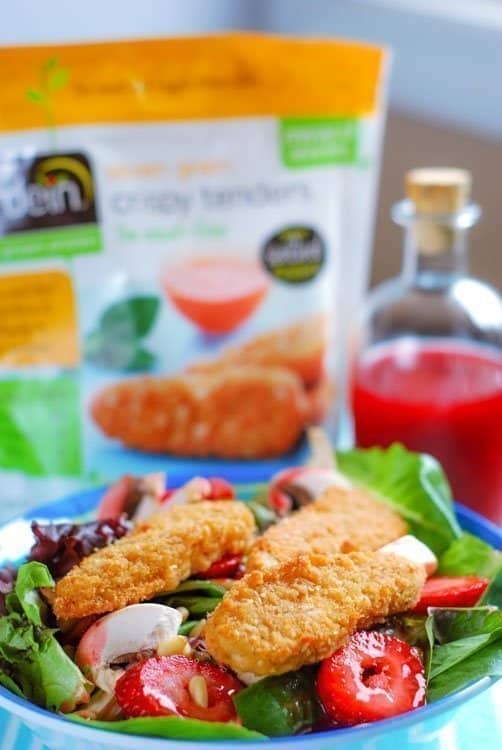 With Gardein, it’s easy to celebrate Meatless Monday! Here’s a coupon so you can celebrate, too! You’ll find Gardein chillin’ in the freezer of your local grocery store. What’s your favorite meatless meal? I will have to look for the Gardein line at our stores. They look good. We do not do meatless mondays per se but we try to go meatless often for sure. I love the salad idea. What a great recipe. Looks delish. We have tried to do meatless Mondays but are never consistent with the concept. 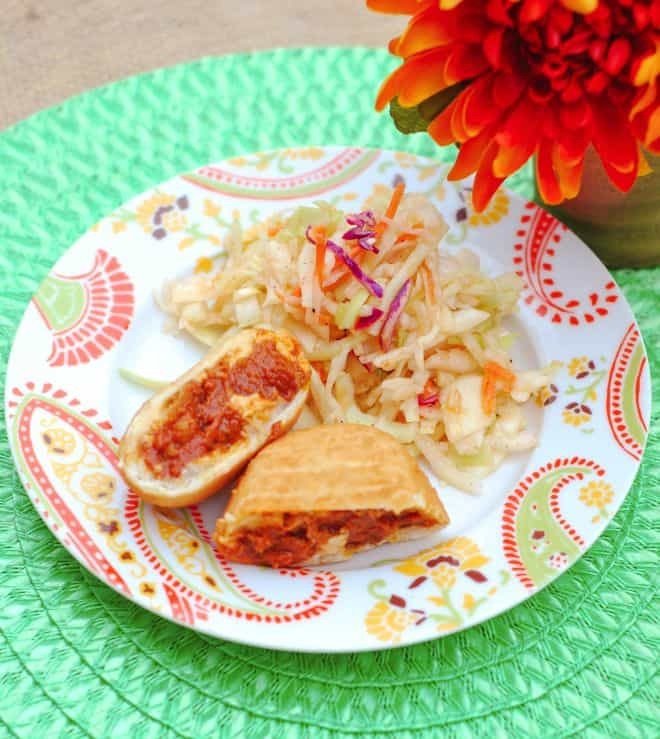 I am loving the cole slaw recipe and certainly plan to try it. 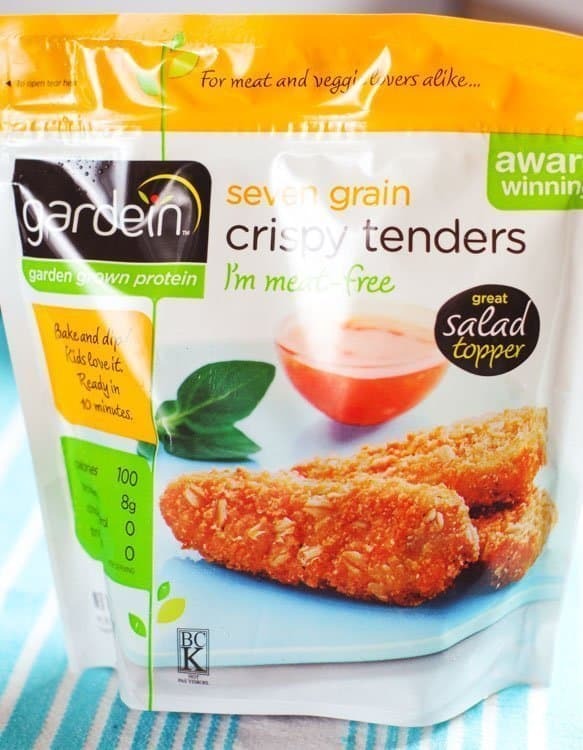 I have tried Gardein products before and am so pleased by their taste–so much better than any other meatless products out there! I have seen these in the grocery store, but I ‘ve been reluctant to try them out! Thanks for the review. We need new options for meatless monday! I have seen these products in the freezer section at my grocery store! Now I’m gonna have to try them! So I am with you on a few things: I don’t eat pork (well I eat bacon) and I have done a few meatless meals but never thought the hibs would comply! Lunch time seems to be one of toughest meal ideaa, too. I did not know freezer meals like these could be healthy. Great to know that! The vege tenders look like chicken. Yum! I don’t think I’ve seen this line in our super market, but I’ll have to keep an eye out. Everything sure does look yummy. It looks so meaty! Its hard to believe there is no meat in them. I’d think it was delicious! I’m like you I work work work and pretty soon I’ve worked thru lunch. I’ll have to look for these. Thank you so much for sharing the recipes. I love slaw! I bet the dressing tastes quite good on that delicious looking salad! I’m actually a pesceterian, but my partner eats meat and I’m sometimes struggling to come up with lunch/dinner ideas that will suit both of us. I’ll need to try to make the strawberry vinaigrette. I love anything with strawberries! Yum, Alli those looks so good! 😀 I would so love to try this recipe. I also forget to eat and end up reaching for cookies–this does sound like a great alternative. I will see if they sell it where I shop and will try it. Great idea for a meatless day. Me and my wife will try to set up a day without any kind of meat too, pure veggies! Those crispy tenders look so good. I’ve never done s meatless Monday but I’ve started to hear of it more and more. I love the idea of a Meatless dinner in our house once a week. I’ll have to give those crispy tenders a try. They look delish! I am always looking for new ideas.. We aren’t huge meat eaters and usually just eat a lot of chicken and I am dying to switch it up! Samantha recently posted…Fried Mac and Cheese bites. My husband loves to eat meatless at least once a week. I bet he’d love to take these for lunch to work. I’ll be looking for them at the store. Stephanie of The TipToe Fairy recently posted…Hotel Transylvania 2 – Win a Movie Prize Pack! i have a lot of vegetarian friends, and they all say Gardein is awesome. I’m really going to have to try it sometime. That looks fabulous especially the slaw. Can I come to dinner? LOL! Yes, we do meatless mondays at our house all the time. This is a great way to save money too! Your recipe looks great, thanks for another idea!